Horror writers are some of the nicest folks you'll ever meet. Middle Georgia State University's Andy Davidson would know. Over the past 14 months, he's secured a place in that particular clan with the publication of his first novel, a vampire tale titled "In the Valley of the Sun," and by getting a deal to write two more horror books for Farrar, Straus and Giroux, one of the nation's top literary publishing houses. "As I've been meeting other writers in the horror genre, they are an incredibly welcoming group of people," said Davidson, director of Instructional Design for Middle Georgia State (MGA). "That's not always true of writers. I think horror writers might be more conscious of how they interact with people because of the stigma of what they write about. One woman who had read part of my novel told me, 'Oh, you're the one with the deranged mind.'" Davidson, 40, comes across as anything but. He's polite, low key, and hardworking. His full-time job is designing online coursework for Middle Georgia State, but he also teaches English at the University part-time and spends huge chunks of his spare time writing. He lives in Cochran with his wife, Dr. Crystal O'Leary-Davidson, an English professor at Middle Georgia State who co-edited a recently published collection of academic articles titled "Monsters of Film, Fiction, and Fable." "Andy and I share a love of horror," O'Leary-Davidson said. "I’m working on the scholarly side, analyzing horror, while Andy, of course, is working on the creative side, writing horror. We have some interesting dinner conversations." A native of Camden, Ark., Davidson began working at what is now Middle Georgia State in 2007, first as a member of the English faculty and later as a part of the instructional design team in the Center for Excellence in Teaching and Learning. (He and his wife met at MGA.) He said he began writing while in elementary school. His appreciation for the wonders of horror came from reading such authors as Stephen King and Dean Koontz. An undergraduate English major at Ouachita Baptist University, Davidson went on to earn a Master of Fine Arts in fiction at the University of Mississippi. Literary journals have published some of Davidson's stories, essays, and poems but he itched to do some different kind of writing. A film fanatic, he decided to try his hand at screenwriting. "In graduate school, my writing would start with a premise but sometimes die along the way," he said. "Screenwriting helped me learn structure and discipline and to come up with an ending that I could write toward." Davidson's first book evolved from his second completed screenplay, which he said began as a cowboy story. With much revision and the addition of a supernatural element, "In the Valley of the Sun" was born. It's a book about a serial killer who, as Davidson puts it, "bites off more than he can chew." One night in 1980, a man becomes a monster. Travis Stillwell spends his nights searching out women in honky-tonk bars on the back roads of Texas. What he does with them doesn't make him proud: it just quiets the demons for a little while. But when he crosses paths with one particular mysterious pale-skinned girl, he wakes up weak and bloodied, with no memory of the night before. Finding refuge at a small motel, Travis develops feelings for the owner, Annabelle, but at night he fights a horrible transformation and his need to feed. Half a state away, a grizzled Texas Ranger is hunting Travis for his past misdeeds, but what he finds will lead him to a revelation far more monstrous. A man of the law, he'll have to decide how far into the darkness he'll go for the sake of justice. Long before the novel ended up on Amazon, of course, Davidson was working to get it published. In 2014, he began shopping the manuscript around to some literary agents. He had no initial luck. Then, his wife suggested they attend a crime writing conference in Nashville. At the conference, called "Killer Nashville," Davidson met an agent who fell in love with his novel. Much rewriting and manuscript shopping commenced, with Skyhorse Publishing eventually agreeing to publish "In the Valley of the Sun." It was released in June 2017. "The book wouldn't exist without my wife encouraging me to go to the conference," Davidson said. "She's the reason it got published." Becoming a published book author was thrilling enough. Even better was the reaction to it. "Publishers Weekly" and "Booklist" gave the novel starred reviews. 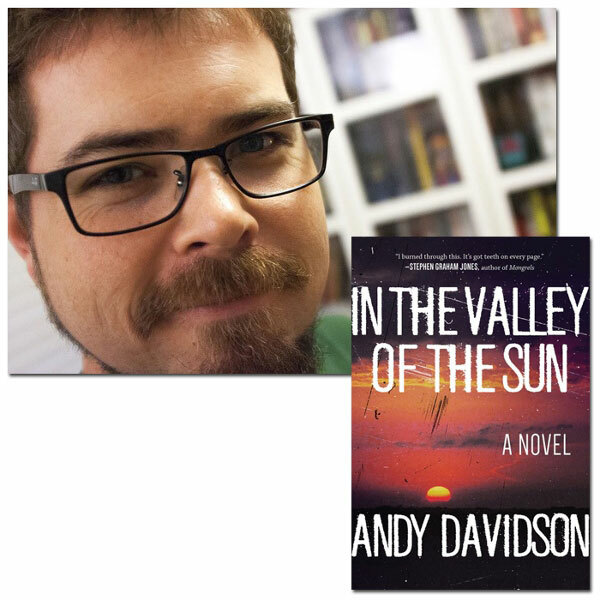 Davidson was a finalist for the 2017 Bram Stoker Award for Superior Achievement in a First Novel, runner up for Novel of the Year in the "This is Horror" awards, and a nominee for the First Novel Prize at the Edinburgh International Book Festival. He was also a finalist for the 2018 Silver Falchion Award, given by the "Killer Nashville" crime writing conference. "Just getting the agent was surreal, and when it got picked up by a publisher, it was even more so," Davidson said. He wrote his second novel, "The Boatman's Daughter," which he describes as "swampy, Southern gothic," while trying to sell his first book. After another extensive revision process, and no doubt boosted by the warm reception his first novel got, Davidson's agent secured the two-book deal with Farrar, Straus and Giroux. "The Boatman's Daughter" is scheduled to be released in fall 2019. "Everything just keeps getting more surreal," said Davidson, who hopes he'll eventually be able to make writing his full-time job. "I'm continually amazed at what's taken place." His advice to MGA students who hope to become published authors is simple: keep at it. "Persistence is the key," he said. "Skill and talent are part of it, but it's also having work that's done and ready to show somebody."